Hello Everyone, Christine here once again it has been a long time since I posted but as they say “you have got to make hay while the sun shines” it is springtime and lots of yard work to be done. 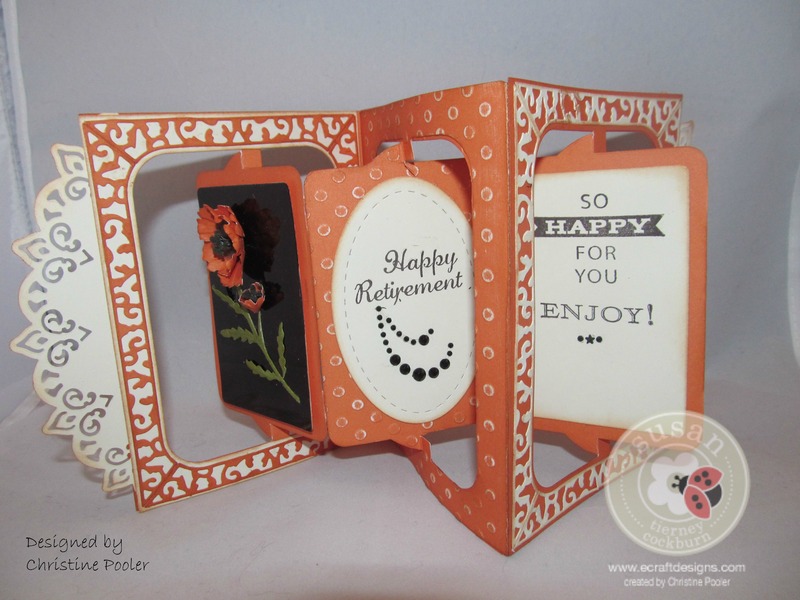 My card today is a retirement card for one of my scrapbooking buddies I used Susan’s Garden Notes Poppy die and Elizabeth Crafts Design Accordion Rectangle die along with a few other ECD dies. b. Take 2 of the panels one with center rectangle still in it and one without the center rectangle in it and emboss them using the lots of dots embossing folder – then sand both embossed panels. 6. 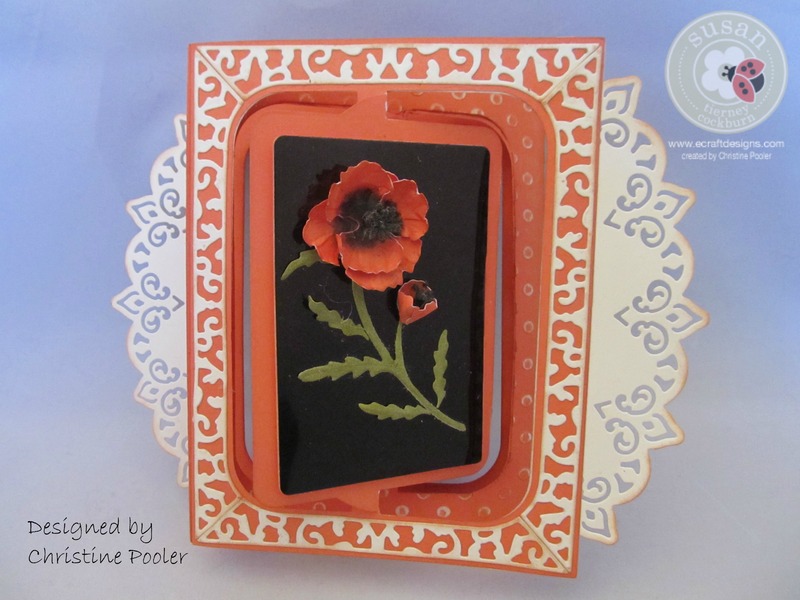 Use the Susan’s Garden Notes Poppy Die and cut flowers from orange cardstock, stamen from black cardstock and leaves from green cardstock. a. Using black PanPastels color the center of the base flower and petals. b. 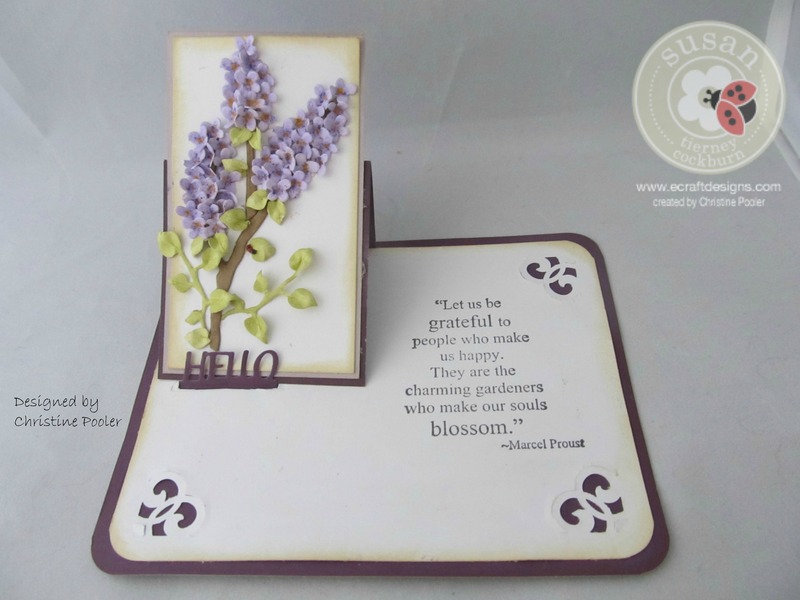 Shape using the large molding mat and the loop tool from Susan’s Garden Tool Kit. e. Lay leaves face down on the leaf mat and using the leaf tool from Susan’s Garden Tool Kit draw a line down the center of the leaves. Lay one of the stems face down and draw line down center of stem and on the leaf. f. Fold the leaves and stem on the vein line and use the bright yellow green Pan Pastels to highlight. lay leaves face down on the molding pad and using small ball tool from Susan’s deluxe Tool Kit and roll just the tip of the leaves so they curve back giving them a natural look. g. Glue the veined stem on top of the plain stem using a clear drying glue. Once your card base is assembled it is time to build on your card. Lay card out flat on work surface. 1. Take the 2 Paris Edges and attach to the edge of the first and last panels using Double SidedClear Adhesive Tape. 2. Take one of the 3 remaining panels (plain one with center removed) adhere over the first panel sandwiching the Paris Frame Edge between the 2 panels and then repeat the process with panel 3 and the remaining plain panel. 3. Take the embossed panel and do the same for the center embossed panel. 4. Add the Katie Frame Flourishes to front and back of first panel and the top of the third panel. 5. Stamp the off white oval with “Happy retirement and add black gem flourish underneath – attach to the center panel (the embossed one). 6. Stamp one of the off white rectangles with sentiment and attach to the center of the third panel. Add small black gems beneath. 7. Attach the black Shimmer Sheetz rectangle on top of the off white rectangle. Add pop dots and attach rectangle to the front center panel. 8. Build your poppy onto the front panel. Add leaves. 9. Attach center panels as the video shows. I hope you have enjoyed this post and you will make your own card.